Is your PC crashing routinely for an unknown reason ??? Regardless of whether your computer crash has brought you to a halt at work, or it’s the family PC at home, we are here to help you. 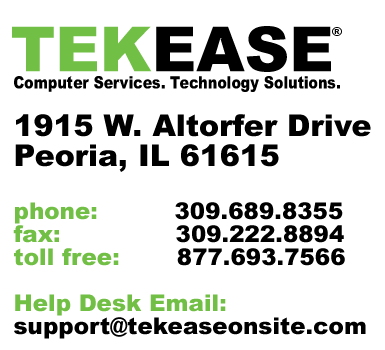 TEKEASE computer service Peoria IL can service all major brands of personal computers and provide you repair and upgrade options. If your PC crashes routinely or is presenting you with endless errors…we can diagnose and repair the problem. The TEKEASE – Computer Trauma Unit™ will come to you at your home or office.